When you’re choosing which type of graph is best for your data, the ability to convey accurate information to the reader is paramount. The “best” type of graph to use is the one that gets the key pieces of information across in the most readable and digestible format, without sacrificing accuracy. Fortunately, along with more complicated types of graph, the simple bar graph or even a pie chart can present many different types of data clearly and concisely. If you’re unsure about the specifics or how bar graphs and pie charts differ and when to use them, the key points are simple to grasp. Pie charts represent data in a circle, with “slices” corresponding to percentages of the whole, whereas bar graphs use bars of different lengths to represent data in a more flexible way. Pie charts show how much each category represents as a proportion of the whole, by using a circular format with different-sized “slices” for different percentages of the whole. Bar graphs use a series of rectangular bars to show absolute values or proportions for each of the categories. Pie charts and bar charts look strikingly different from one another, but from the perspective of somebody looking for the best way to display data, the key differences are the fact that pie charts can only show proportions and that bar graphs can display changes in quantities over time. 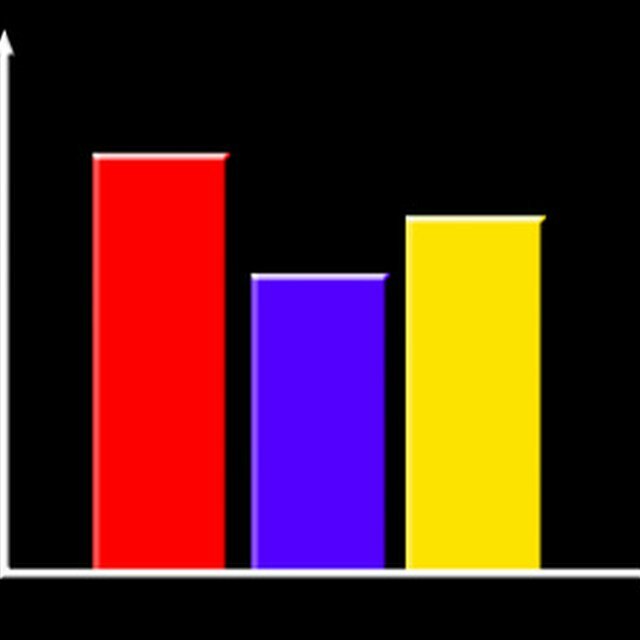 A bar graph represents data using a series of bars across two axes. The x-axis (the horizontal) classifies the data by group, with one bar for each group. So for example, if you were displaying the number of beads of each color in a jar, the x-axis would have a section for each color, and each color would have its own bar. The y-axis (the vertical) shows the value for the category for each bar. In the bead example, this would be the number of beads. So the bar for green beads might extend up to five, for example, whereas the bar for red beads may extend up to only two. The y-axis can be many different values, though; for example, money, a growth rate, an average speed or even a percentage of the whole. Similarly, the x-axis values and bars could represent the same quantity at different points in time, and this capability shows a big difference between bar graphs and pie charts. Pie charts are circular graphs that display percentages of a whole as if they were slices of a pie. This is very similar to bar graphs in that the individual slices of pie mean that the data has to have the potential to be categorized. The “slices” of the pie have sizes to indicate the proportion of the whole they represent (although a legend beside the chart usually shows the precise figures), but unlike bar graphs, pie charts can’t be used to explicitly show absolute number values for each group. The shape is the most obvious difference between pie charts and bar graphs, but the restriction to proportions with pie charts is the most important. Bar graphs have a wide range of uses, many more than pie charts. The flexibility of a bar chart allows you to use it to present percentages, totals, counts and many other things, provided you can find a reasonable way to group the contents of the x-axis, whether by category or by time (e.g., one bar per year or per month). Unless you have a specific reason to choose a pie chart, then a bar chart is probably the better choice. For example, if you were showing the results for a class president election in school, each candidate would have his or her own bar on the x-axis and the values on the y-axis would be number of votes the candidate received. If you were showing the revenues of various companies, you could use a bar chart with a bar for each company and the length corresponding to its revenue in dollars. In both of these cases, you can easily see at a glance the category (in the examples, the candidate or company) that has the highest value (in votes or dollars, in the example), and the graph conveys the main information in a straightforward and easy-to-interpret fashion. Pie charts are less likely to be useful because they display proportions of a whole, and when the proportions are close to each other, it can be difficult to determine if a specific slice is bigger than another. However, you can use pie charts when the proportions are important in your data and especially if the proportions are substantially different. If you have a specific point to make – for example, showing that a certain household expense makes up over half of your outgoings – then a pie chart can be the best way to do so clearly. For example, a pie chart works well for displaying a breakdown of sales for each item for a business. Your total sales are the whole “pie,” but the slices tell you how much each product contributes. You might sell fruit, for example, and a pie chart of the different types of fruit you sell shows that apples make up the largest chunk of your sales, followed by bananas. If you were planning a regular school social event for some fellow students, you could use a bar chart to show how your budget was being spent. For example, if you provide snacks, you might find that 20 percent of your total spending each month is on food, and if the smaller slices of the pie include more important expenses, the chart could make it clear that more of the budget should be spent on those and less on food. Johnson, Lee. "Difference Between a Bar Graph & Pie Chart." Sciencing, https://sciencing.com/difference-bar-graph-pie-chart-5832998.html. 23 April 2018.